ICANN coordinates the Internet's unique identifiers – domain names and IP addresses – across the world and defines policies for how these identifiers should run (learn more). Policies for generic top-level domains (gTLDs) are developed within the Generic Names Supporting Organization's (GNSO) Policy Development Processes (PDPs). 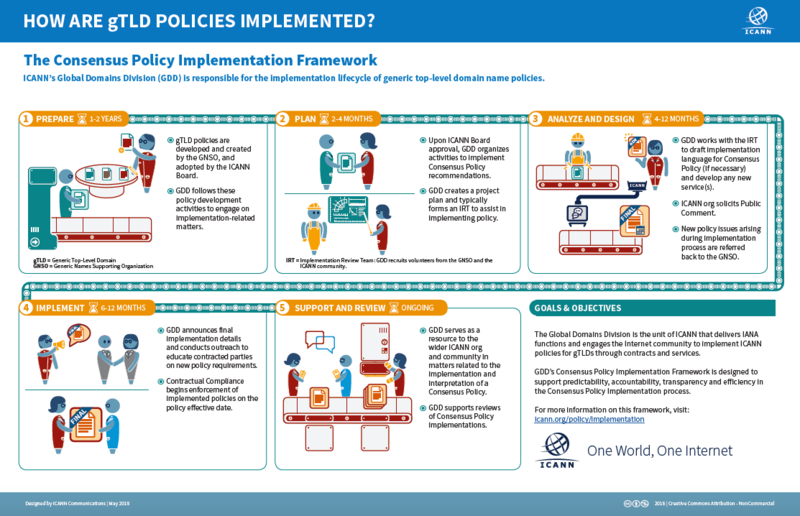 Once the policy recommendations emerging from these PDPs are approved by the ICANN Board, ICANN's Global Domains Division (GDD) implements them according to guidelines established in the Consensus Policy Implementation Framework (v2018) (CPIF). Assembling a team of volunteer experts—an Implementation Review Team, or IRT—in the relevant subject matter to provide advice and support. Conducting public comment periods on proposed plans and methods. Policies developed within the GNSO and implemented by GDD affect many companies and organizations in the domain name industry. 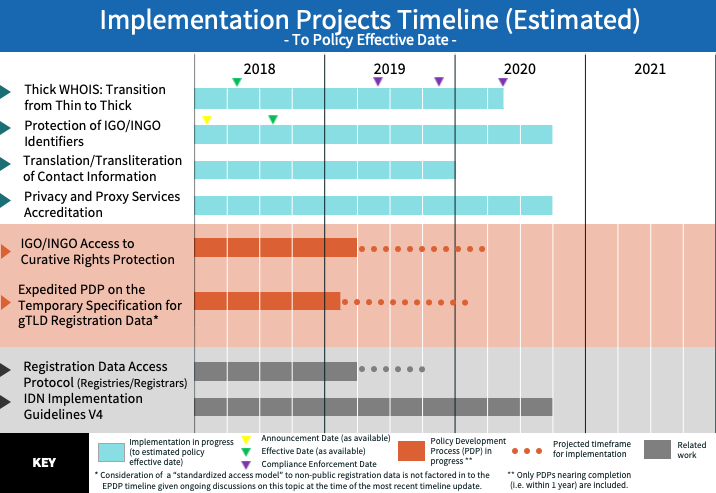 ICANN has committed to simplifying implementation via the Policy Change Calendar Initiative [PDF, 166 KB], which aims to provide contracted parties with a consistent, predictable timetable for updating their operations to meet new policy requirements. Since May 2015, GDD has worked to bundle the announcement and effective dates for related policies. Policies within a bundle are announced together, which triggers a window of at least six months for contracted parties to update their operations to ensure compliance with the new policies. Effective dates are the same for all policies in a bundle, which are noted in the announcement. Learn more about the policy change calendar initiative [PDF, 166 KB]. The CPIF provides that ICANN org periodically revisit the Framework to encapsulate additional best practices or to adjust the steps as a result of lessons learned with previous Consensus Policy projects. Previous versions and tracking of changes between versions are archived in this section for reference.